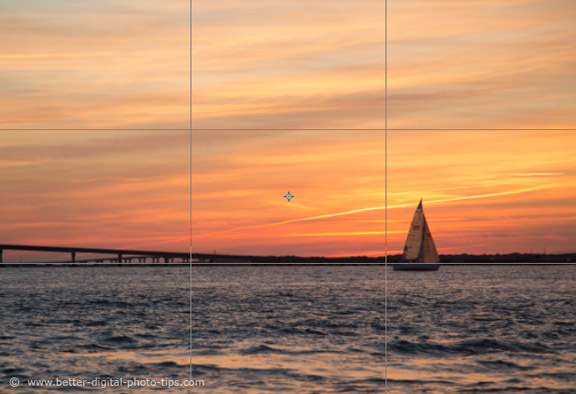 Why would you want to break the rule of thirds in photography? After all, aren't you supposed to follow the rule of thirds so all your photography will be amazing? Isn't this composition guideline one of the most important compositional guidelines you can use in your photography? Well, not so fast my friend! I'm guilty of using the rule of thirds quite a bit, often automatically without even thinking about it, particularly with nature and landscape photography. Before we dive into when not to use the rule, let's take a quick look at the epitome of good use of the rule of thirds, a seascape. It's almost always a good idea to use the rule of thirds when shooting traditional landscapes and seascapes. When you have a small object, like the sailboat in this composition, it usually makes sense to place the horizon on one of the "thirds" and compose your photo with the main subject at an intersection of the imaginary dividing lines. Now, how about a good example of when to break the rule of thirds in photography? 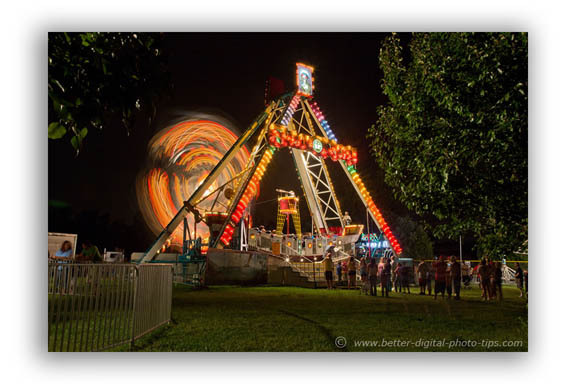 Check out this long exposure photo I took at a local carnival one warm summer's eve. I composed this night-time scene by placing the pirate ship ride directly in the center of my frame. Although they're dark, the trees are great framing elements that I purposely included on the sides of the amusement ride. The railing in the lower left and the line of people in the lower right of this photo both act as leading lines, steering our attention inward toward the center of the image. The photo above is also balanced with an equal "weight" of objects on both sides of the composition. 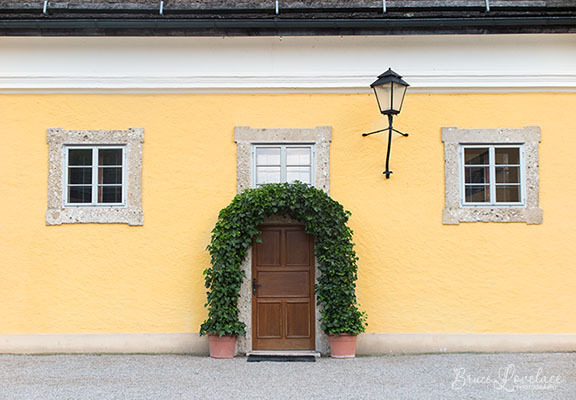 You can learn about other compositional techniques like framing, leading lines, and balance in this post on composition. Here in the next example is a different situation in terms of subject matter, but it's a photo where I partially used the rule of thirds to compose the shot. Even when I break the rule I sometimes use it partially. I moved closer, zoomed my camera lens just the right amount to center Yosemite Falls between these two trees. Notice though that I placed the top of the falls at about 1/3 of the way down from the top. 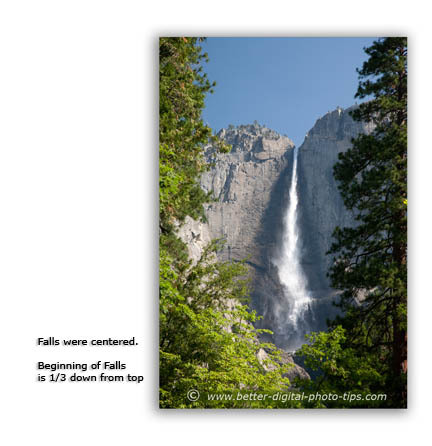 I didn't place the falls off center at a 1/3 position because the image would have been too unbalanced. The lighting was perfect from this vantage point. I liked the contrast of the sunlit water cascading in front of the dark, wet rocks that were still in the shade. This is another example of including framing elements in the frame to direct the viewer's attention toward the main subject. 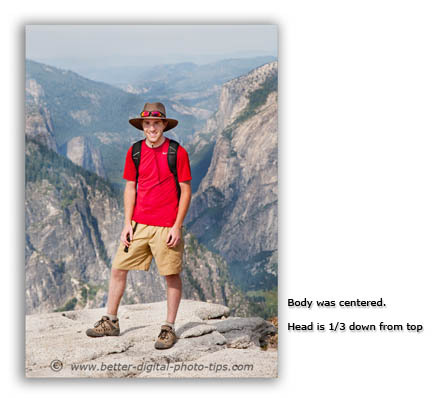 Once again, in this photo of my son when we hiked to the top of Half Dome in Yosemite, I centered my subject, but still placed his head about 1/3 of the way from the top of the composition. Being a portrait photographer, I couldn't help but direct him to turn slightly his body slightly to his right to create an angle rather than have him facing dead on to the camera. 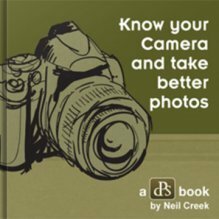 Usually it is not a good idea to have an individual stand directly facing the camera, but that's more of a topic for an article on portrait photography tips. Here's an example of a composition where the rule of thirds make no sense. 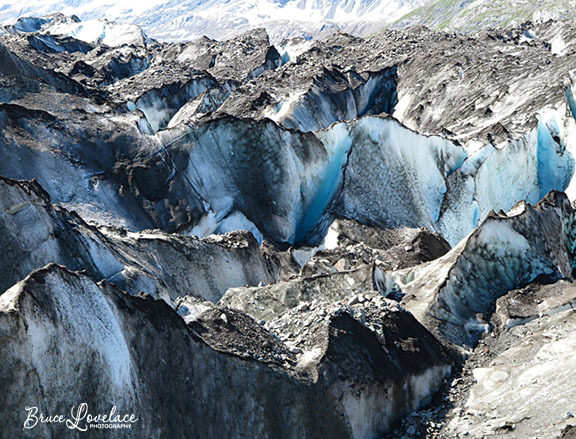 It's a photo of the receding Lamplugh Glacier in Alaska. This close-up composition is really an abstract study of the textures and colors within a glacier. The glacier photo above is a good example of when the rule of thirds is not appropriate to use as composition technique. 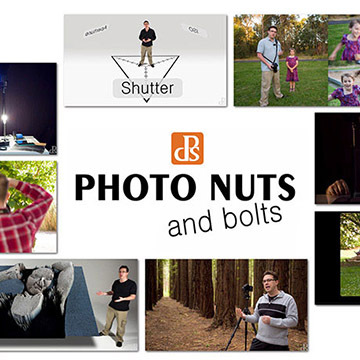 Here's another example of when not to use the rule of thirds. When you're concentrating on geometric shapes, diagonal lines and balance become the prevalent techniques to use. Giants Causeway Visitors Center, Northern Ireland. 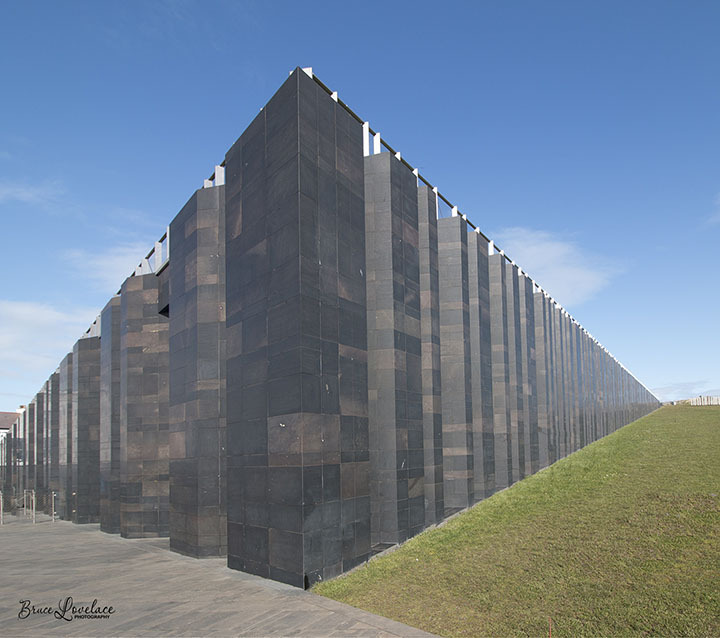 The photo of the remarkably designed visitor's center at the fascinating Giant's Causeway in Northern Ireland does not use the rule of thirds. I was intrigued by all the major diagonals in the overall shape of the building contrasted with the thousands of small rectangles that make up the sides of this building. Architecture photography is a good example of a subject that typically doesn't call for using the rule of thirds in the composition. The photo below is another good example of when to break the rule of thirds in photography. Try taking some photos that are symmetrically composed. One of the things I like to capture is photos that are symmetric with one element within the photo that breaks up perfect symmetry. When I first looked at this scene I started laughing because it struck me as looking like a silly face that was watching all the tourists walk by. There are several points of interest in the photo and the rule of thirds was not the right technique to use. Watch less TV. 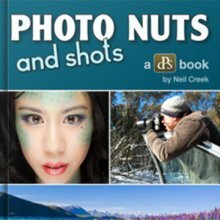 Shoot more photos!